We highly advise you to refrain from a program known as ShoppingDay. Doing so is essential because this application has been classified as one more adware program. If you ever discover it up and running on your PC, make sure to execute its complete removal right away. If you are not familiar with adware applications, you must know that they can be incredibly annoying. In fact, they are infamous for aggressively interrupting online session, which makes browsing the web an annoying and frustrating experience. If that was not enough, you should know that this ad-supported program could expose your operating system to suspicious and even dangerous online content. Find out how that could happen by reading the rest of this report. In addition to such information, we also include a comprehensive removal guide, which you should use to delete ShoppingDay once and for all. 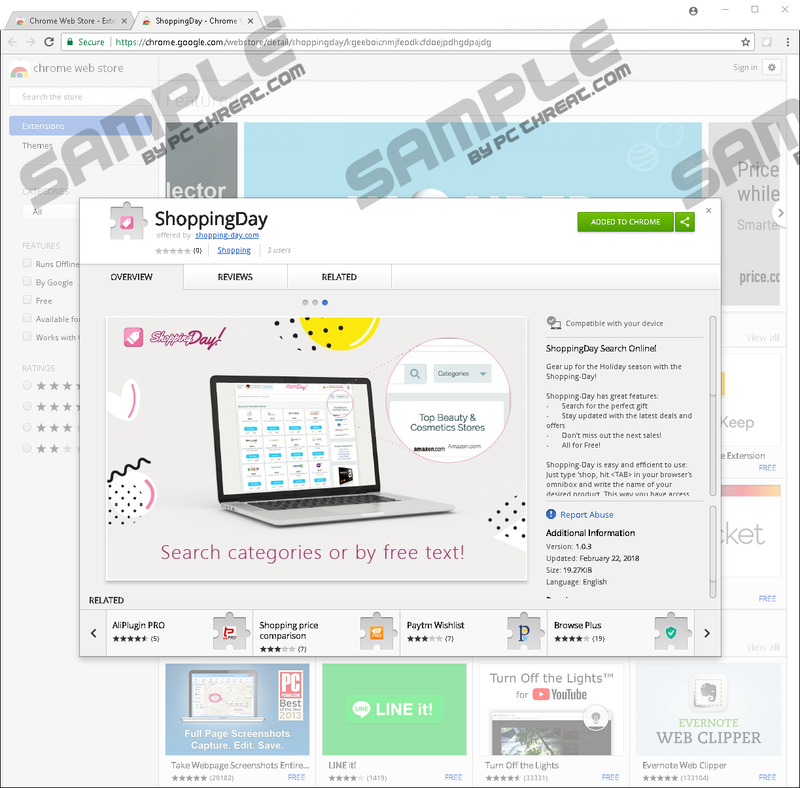 Developers of ShoppingDay advertise it as a great tool that frequent online shoppers should have it up and running on their PC. On its official website, it is marketed as an application, which should present you with discount deals and coupons to help you save money while shopping online. At first, it might seem like a great piece of software. However, there is more to this program, than you might think. During the extensive analysis, our researchers have noticed that this ad-supported application installs a questionable third-party extension. As it turns out, it does a couple of different things; it makes changes to your browser's default settings and establishes a lasting connection with an adware server. Due to such functionality, your online experiences will be affected negatively. You will be presented with a suspicious third-party site each time you will open a new tab. Because of questionable connectivity, you will notice an unusual amount of third-party web content while browsing the Internet. In most instances, such content manifests as dubious ads, pop-ups, and coupons. In severe cases, your browser could be filled with so much invasive content that it might crash without any warning. It should be self-evident that because of this intrusive adware program, your online activities will be severely compromised. To restore your browser's default functionality so you could browse the Internet without any interruptions, you need to execute a complete removal of ShoppingDay as soon as it is found running on your PC. Terminate it in just a few steps by following the instructions below. As mentioned, there is more to ShoppingDay than its annoying features. During the extensive analysis of this adware program, our malware experts have discovered that it could be distributed using bundled installers, which are notorious for hosting all sorts of invasive and harmful applications. Thus, there is a chance that other dangerous programs could come along. That is why we advise you to check your operating system for devious software if you already have ShoppingDay up and running on your PC. Furthermore, you should know that we urge users to refrain from all content that is related to the adware in question. Doing so is essential because some ads or pop-ups might host with redirect links, which could lead you to malicious sites. Malware developers could craft some of them, and just entering a webpage like that might be enough to infect your operating system. You should also know that cyber crooks use fake online stores to steal credit card data and other sensitive information. As you can see, this ad-supported application could prove to be quite dangerous. It is best not to take any chances with ShoppingDay, and conduct its complete removal without any hesitation. Remove ShoppingDay with the help of our detailed removal guide. Under no circumstances delay the termination of this intrusive application because keeping it up and running on your PC might lead to further virtual security problems. Once you are done with the instructions below, be sure to recheck your operating system for anything associated with ShoppingDay. Doing so is vital because leftovers of this adware program could act suspiciously. For example, just a few traces could initiate this application's restoration. In other situations, those same leftovers could be just enough for this ad-supported program to continue working. Users that find manual removal and analysis of their PC too complicated, to carry out on their own, should use a professional antimalware tool to delete ShoppingDay automatically. Quick & tested solution for ShoppingDay removal.